gluten free banana bread mini muffins — Powell & Co.
Every week, J and I buy bananas at the grocery store. I usually eat them before they get too ripe, but this week was not one of those weeks. I came home today to some sad, brown bananas. I almost threw them away, but the newly-found budget queen in me just couldn't do it! So, I got to work on what I hoped would be a yummy muffin recipe. They turned out better than I imagined! Last year, I completed Whole 30 and it taught me so much about what foods trigger me. Gluten was one of the biggest culprits of my energy depletion, bloating, and triggering of my autoimmune disease. I strive to eat well and avoid it, but I haven't done so well with it as of late. One of my favorite indulgences is sweets. Sweets are definitely my vice. So, the only logical solution is to create treats without all those bad-for-me ingredients. These could easily be made dairy free as well, if you sub the butter but... I wasn't interested in that because BUTTER IS EVERYTHING. This recipe yields 24 mini muffins and takes around 30 minutes from start to finish (20 minutes prep/12 minutes baking). Preheat your oven to 350 degrees. Like, seriously, do that. I always forget. In a mixing bowl, mix all your dry ingredients (flour, chocolate chips, pecans, sugar, baking powder, baking soda, brown sugar, salt) until combined. In a separate bowl, mix your wet ingredients (mashed bananas, butter, egg, milk, and vanilla). Mix the wet ingredients in with the dry ingredients until fully combined. 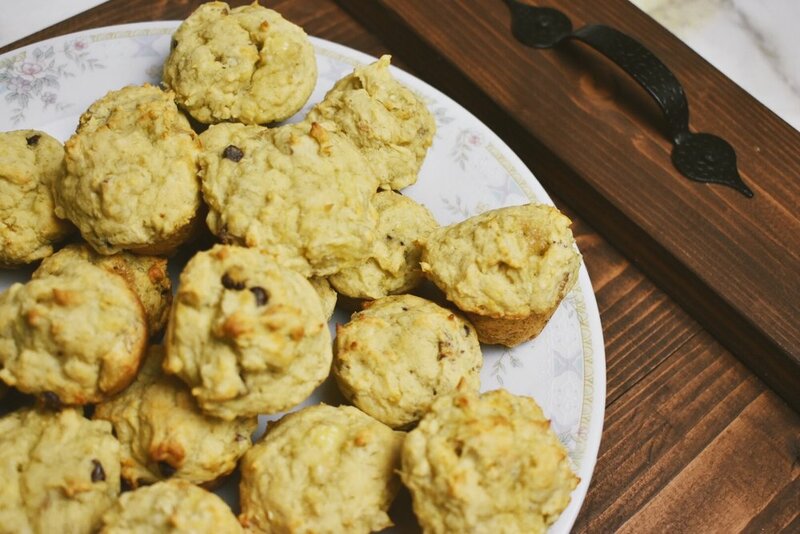 Spray mini muffin tins with cooking spray (I like EVOO) and fill each cup with batter. You may reserve some chocolate chips/pecans to put on top, as they would look more aesthetically pleasing. I wasn't too worried about that. Bake for 10-12 minutes, let them sit for about 5 minutes to cool, then enjoy! These were definitely a hit in my household! Even our dear friend, who is a notoriously picky eater enjoyed them. They are the perfect breakfast, but still sweet and decadent enough to feel like a dessert. I hope you enjoy them as much as we did.